The Knight Knetwork is pleased to announce the newest site in the Knetwork – The WeeWar Times! If you aren’t familiar with WeeWar, it’s a turn-based strategy game you play from your browser. WeeWar is an amazing site and is one of the most innovative games around when it comes to giving players control. A useful API, attentive developers, and an addictive game have created a vibrant community. 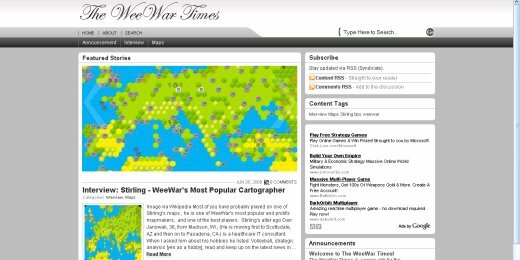 The WeeWar Times was launched as a news site to serve that community and will provide an outlet for News, Tips, Interviews, and Map Reviews. As a player, you start with 1500 points. If you win a war you get points and the other person loses them. You get more points for beating someone of a higher rank. It can take more than an hour to finish even a small 1 on 1 game, the more players, the longer it takes. Take care not to join too many multiplayer games on large maps or you will fill up your available games and not be able to play while waiting on others to log in and go. I recommend leaving at least 2 slots free for small games with short time limits so you can always play when you want. As you’re learning, use the greasemonkey scripts to get an idea of how fights will turn out and to keep track of how the game is progressing. Want to play MORE? Upgrade to a Pro account and get 10 games instead of 4, plus extras! You’ll also be supporting the game’s future, if that kind of thing matters to you. It’s been a while since I’ve been involved in any Massively Multiplayer Online Games. When I was involved it was amazing to see how friendships could spring up and how people could come together to support each other and all pitch in to have a good time and build something together. It was also amazing to see how it could all fall apart, sometimes in what seemed like an instant, and other times gradually over time as people lost interest in the group’s goal and each other. There was, and I have to assume still is, a TON of drama that goes on in any guild and I always assumed that any gathering of a group not really known for it’s social skill set was doomed to eventual failure. While that may be the case there is a lot of interesting information out about group dynamics and social group limits and optimal sizes. I was really doing research for an article on Facebook and other social networking applications, but it turns out the MMO games have really proved to be THE rich data source for social theorists. The Dunbar Number as a Limit to Group Sizes – Digging further into the Dunbar number, Christopher Allen does a good job explaining the Dunbar Number and explores how satisfaction varies with the population of a group, be sure to read his other posts on the subject. Palo Alto Research Center’s PlayOn – First indulge yourself in their Guild Name Generator, and then check out the content. They’ve gotten some really good data and have used it to study player’s playing times, habits, and personality types.